Laminitis... a swear word in the horse lovers community. Something I didn't know much about until recently. 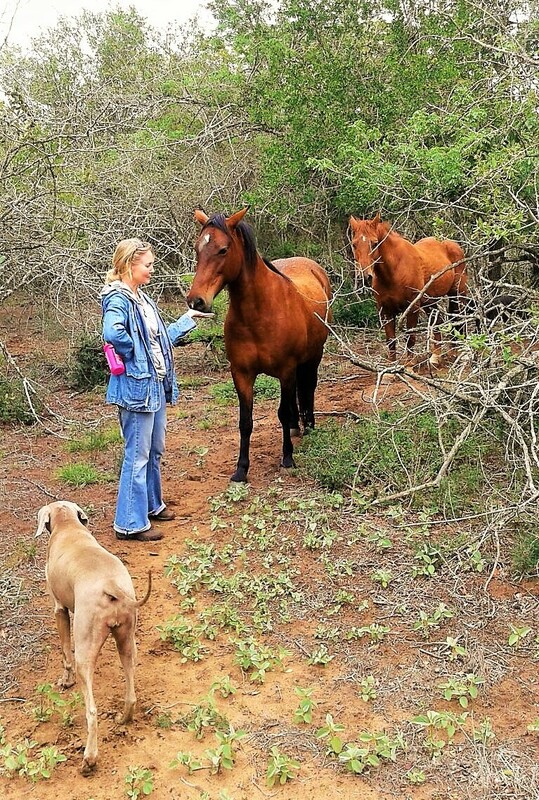 Each horse is different and each horse owners story is different. This is my story, and where my research led me. Photo taken about 2 years Prior. Fire is approximately a 15 years old mare, which in my opinion is middle-aged for a horse. Not old! My other horse is still fit and strong at 28! They have been on the same feed for years, which is the only horse feed we can get in our area, but it is quite high in Molasses. I have known Fire since she was 4 years old. 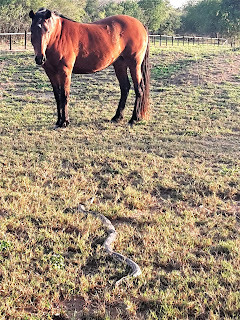 I got her rider ready for a friend who owned her at the time. Fire contracted African Horse sickness over the time of her training, I managed to pull her through that one. Her owner moved away from the area a few years later, and gave me Fire. She has been a very healthy horse ever since. The photos here are all of her happy and healthy, I really battle to take photo of a sick animal - it just doesn't feel right. We had an enormous electrical storm one night, storms are the norm in the summer months, but this one was seriously electrically charged. It took down most of our electricity, and we were without power for the next 2 days. Did this cause my horse to suddenly be lame the next day? I was not sure. She was hobbling slightly on the front left, I thought she had probably slipped and will be better in the morning. The next day she was lame in both front feet. 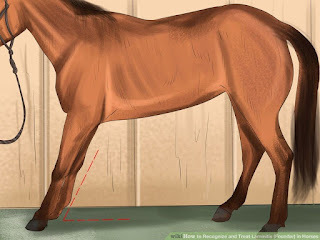 And had that typical (what I now know) Laminitis pose where they push out there front legs leaning back into their hindquarters, trying to get the weight off their toes. I called my vet for assistance. The vet asked me to check for any heat on her hooves. There was nothing abnormal -but we are talking January in Zululand, which equals frigging hot all round. I was asked to check down her tendons for any re-action change - Nothing. The vet did all the same checks I did a couple of days ago. No temperature, heart rate was a bit high (60) which can be an indication of pain. No heat in the feet. Vet's conclusion: A fall with injury to the lower part of the neck as there was slight swelling across her shoulders. No improvement whatsoever. I asked for more pain killers. The vet changed her onto a different pain killer for another 4 days. But said she wouldn't be allowed any more after that for at least a 10 day break, as it can cause stomach ulcers. My farrier very conveniently and luckily did his 6 weekly rounds. He examined my mare and is convinced without a doubt that she has been mis-diagnosed and that she definitely has laminitis. He suggested taking her immediately off her concentrates. I contacted my vet to let him know, He asked to see her again to check his diagonosis. Which he later considered his own (the vet) to be correct, not the farrier. As I am sure you can imagine, I was very confused on what route to go and who's advice to take. My vet consulted with a horse vet, and got back to me, saying it is laminitis. And that in their opinion it would be best to put her down. They suggested doing x-rays to see if the Pedal boned had turned / dropped in which case they said there is no hope. I was devastated! I consulted with my farrier who has had a lot of experience in laminitis cases, to which he totally disagreed with the vet. He said you can save a horse with laminitis even if the pedal bone has dropped, and in his experience: laminitis will heal! It is only about 5% of cases where you actually end up having to put the horse down. This gave me huge hope! I now at least knew what I was dealing with and on the advice of my farrier, had taken her completely off her concentrates, by this stage she was also off her pain killers. There was zero improvement, but it was also not getting worse. Even though I knew I had to get Fire off her molasses rich concentrated feed, My intuition still told me that this had to be diet related (as most things are). Which meant I would still need to get whatever she needed into her. 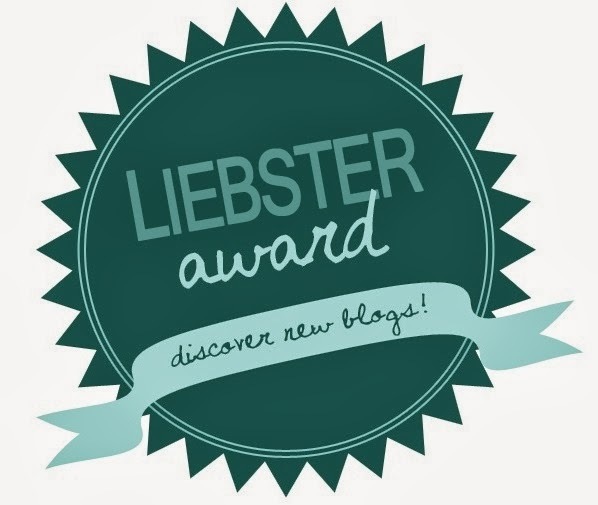 I did a whole stack of research, with a few very interesting helpful sites which I shall quote from below, so that my story might also help you in your research. I found Pinterest (Search Laminitis in horses) quite helpful and pinned what I considered the most helpful pins onto my board "Furry Pet Care"
This site is very informative on what a laminitis horse is lacking in its diet. And how to fix it. There are quite a few Facebook chat groups about horses with Laminitis. You may wish to also check those out. As far as I understand: A Laminitic horse more than likely has an insulin problem and needs to be taken off all sugar immediately. Our marulas are out in full fruit in January, maybe this is what set Fire over the edge... coz, oh boy... she does love those sweet juicy marulas that have dropped all over the ground. My horse has 200 plus hectares to roam free on, plenty of space to work off the sugar. I confine them at night, their night paddock is about 1ha in size. Admittedly they are more lap pets than riding pets. They have a lovely, cushy, relaxed life! Many laminitis horses have elevated insulin levels in their blood. The reason the insulin is elevated is that it is not able to get into the cells. Normally when a sugar or carbohydrate is eaten, the blood sugar levels increase, insulin is secreted by the pancreas, glucose is carried into the cells by the insulin and the blood sugar goes back to normal. In insulin resistance, the cell walls are too stiff to let the insulin do its job properly. So the glucose, instead of providing energy for the cells, gets stored as fat. domestic horses are given huge amounts of high nutrient grasses and confined to much smaller areas. This results in a horse who consumes more sugars than it's body can handle - as it's not burning them off with movement - and this is often the main cause of laminitis in horses. The horse must be able to move freely but within the confines of a paddock, She needs to be able to burn off any sugar in her body. Also a horse that does not move is more likely to get colic. A horse's digestive system is vital to their continual movement. Take the shoes off and do regular bare-foot trimming. There are different view on whether or not to put in a wedge on the heel or not. After some research, I decided against this, as people who had gone this route said it did not help, and eventually the wedge was removed. The hoof also naturally changes its shape over the laminitis period in an attempt to rectify itself. I decided to let the body attempt to heal itself. 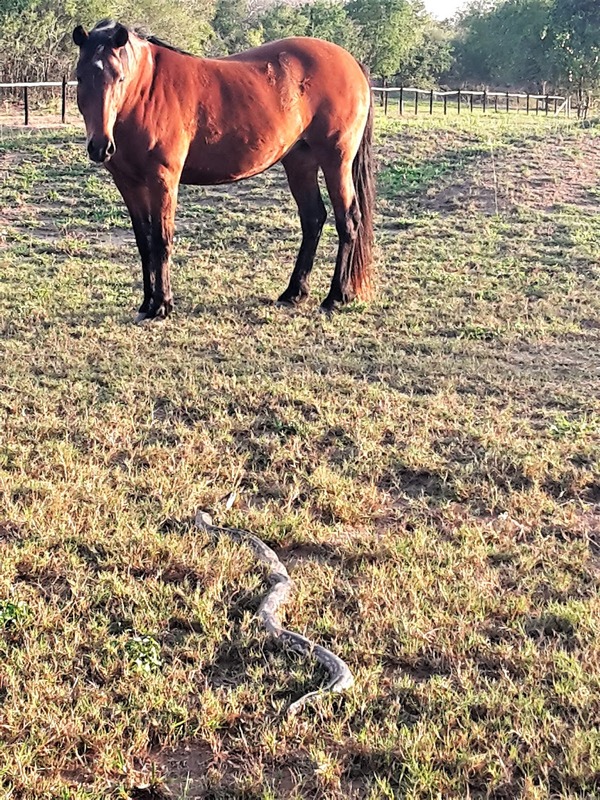 Fire being super inquisitive about a python in her paddock. Horses and ponies with EMS often have telltale symptoms, including a tendency toward obesity, insulin resistance and recurrent laminitis. Abnormal fat deposits along the crest of the neck, tail-head and above the eyes are typical, even when the horse is at a normal weight. The condition most often occurs in ponies and other breeds that evolved under harsh conditions and tend to be easy keepers. Horses with PPID may have symptoms similar to EMS, such as patchy fat deposits and insulin resistance, but PPID usually begins to appear in older horses (over age 15). They may also start to lose topline muscling and develop a thick haircoat that sheds out later than normal, or eventually not at all. If you suspect your horse has either of these conditions, schedule a vet visit for blood tests that will help confirm a diagnosis. If your horse has a metabolic disease, consider it a huge warning flag that he is at high risk for pasture-associated laminitis. To give her the Minerals & Vitamins she needed to heal. It is not that easy to get feed delivered out here to us. For Starters, I fed the below mix twice a day. The list looks long, but it was quick to mix up, and did Fire (my horse) the world of good. Improvement was visible from the next day already! And only a slight limp 1 week later! 2 Tbls Linseed / Flaxseed crushed in a coffee grinder or food processor. (do not soak! See why here): High in omegas and Essential Fatty Acids. It also has remarkable anti-inflammatory properties. 1 Tbls Kombucha Vinegar: This is optional, I brew Kombucha so I added some, it is very good for probiotic health as well as joint health. The vinegar has no more sugar left in it. 1/4 tsp Blue green algae: for nutrients. "Natures Choice" do a Spirulina powder. 2 capsules Co-Enzyme Q10: OPen up the capsules. Reverses free radical damage and found to be very effective with Laminitis. 1 capsule of Vitamin C: Open it up. Great anti-oxident, nutrient and Immune booster. 1/2 tsp MSM powder: "Nature's choice" does a powder version: Important for the sulphur content which is vital in the laminae of the hoof. 1 tsp Protexin: an animal pro-biotic. 1 tsp L-Glutamine powder: An important amino acid during stress, and to help tight muscles. I did the above morning and evening until such time as she was walking normally, (With a slight limp). You'll have to go by your gut feel here. I then only fed her the top 8 ingredients in the morning, and did the whole lot for her evening feed. I did a fair amount of research on this. It is still (even more so now) for your horse to get a balanced diet. But without sugar! I would strongly suggest never going back onto a diet containing molasses, as laminitis can re-occur. Your horse is more prone to it now than before. My horses are fortunate enough to have a lot of grazing. We also have not had much rain, so our grass is pretty dry. But in the cases with pastures that are lush and sweet, you will need to confine your laminitic horse into any area without green grass and feed hay. No sugar allowed... remember. There are quite a few sugar free feeds out there which are fine for laminitis horses: These are the ones I found suitable in South Africa. I opted on the Pasture Plus and the Speedi beet, mainly because Assagay Feeds could get the feed delivered to a town not too far from us. Speedi Beet is an amazing feed, I can highly recommend it to any horse lover. I also get hold of of some supplements to compliment the feed. Royalynne (Equine Care, pet care) facebook group. I would recommend looking into her products. Yip, this plays a huge role. You are probably very stressed about the condition of your horse. Try to remain as calm as possible. Your horse is in tune with your emotions. Do what you can for your horse and let it go. Let the emotions go. Picture in your mind's eye, everyday when you go to feed your horse, what it normally does when it is healthy: hold this thought. Your thoughts are very powerful and will create your reality. Life is about lessons learnt, try to figure out what lesson this situation is teaching you, Maybe it is patience, maybe it is letting go of fear. Once you figure out the lesson there is no longer a need for it. Picture beautiful healing white light coming down over yourself and your horse let it continually stay there. I am absolutely amazed by the improvement in Fire. 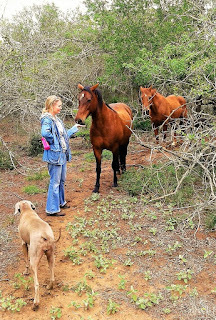 I have started letting her out her camp again to graze with Thunder (my gelding) in the afternoons. It was almost a month to the day, that she attempted trotting again on her own. Fire contracted Laminitis again exactly 1 year later. This time from the delicious Marulas which drop indigenous fruit all over the farm. This is more than likely what set her off a year ago. She does love those sweet Marulas!. I had to keep her within her paddock for 4 months with no Marula trees! This time she was not nearly as bad, and recovered a lot faster. A lot of people suggest a dry sand paddock. Mine is not. It is grassed, but I cut the grass short. The grass is green from summer rains and she can run around in the paddock to burn off excess sugar and to graze. She still improves doing this.